Summertime in the North American countryside is full of long, sunny days and open fields of wildflowers. 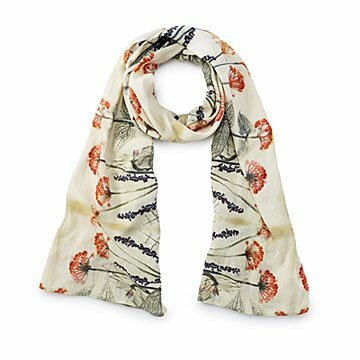 Inspired by the beauty of our warmer months, Neena Jhaveri designed this one-of-a-kind floral scarf so that you can wrap yourself in blooms year round. She used clay blocks to create the pattern, then her composition is reproduced on super soft high thread count cotton. Made in India. Hand wash, air dry, iron on cotton setting. This is just a beautiful scarf. I love the pattern! This scarf is very pretty. The colors are more varying and vibrant in person. The only thing you should keep in mind is that it is thin.